By now, we’ve all celebrated Thanksgiving, shopped till we dropped on Black Friday and have gone wild online during Cyber Monday. Now we land on the national day for giving called, #GivingTuesday. This rapidly growing movement, now in its 2nd year, promotes ALL forms of giving – time, talents, and generosity – small or large. Social media is an integral part of the movement to help share your personal experiences of “giving” to others and inspiring your friends and co-workers to get involved. Here at Cityteam, we were blessed with a matching gift on GivingTuesday to help raise $20,000 in 24 hours. So let the twittering begin, and photos be posted because hundreds of people are on the move to give to Cityteam so we can double the amount of meals we serve to those in need. Here is a simple video that carries the message of “Double the Gift & Double the Joy” and helping others through your generosity. Cityteam also has a website called- Gifts That Matter – where you’ll find a list a special gifts that you can give in honor of a friend or loved one, while helping someone in need at the same time. So if it’s not on Oprah’s Gift list, then you’ll find it on Cityteam’s list. We’ll even send a beautiful Christmas card to your friend or loved one if you select one of our gifts in their honor. 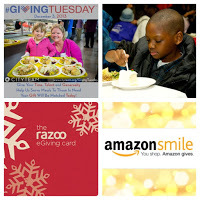 Also you’ll find fun ways to shop and help Cityteam with the AmazonSmile website and the hottest new charitable website called Razoo. Their eGiving Cards allow your family and friends to make charitable donations to any of their favorite charities like Cityteam. It’s going to be a wonderful season of giving.